After staring longingly at those huge screens in high street shops in the run-up to Christmas, before deciding that casually spending a few grand really wasn't an option, the price tag clinging to this 37in LCD could be a sight for sore eyes. At less than £1,300, this is equivalent in price to a very good 32in,HD Ready LCD,equating to an extra five inches for free! Or at least that's the theory. As the more canny readers will have already guessed,it's not quite that simple,and although this TV is HD Ready, there isn't the amount of advanced features usually found on smaller screens of the same price. Still, given that the only 37in screens we've seen so far have been at least £2,000,and more importantly,that we've been impressed with ViewSonic's previous budget screens thus far,the N3760w could provide a watershed in TV pricing - if it's any good. This almost unbelievably priced ViewSonic's neat silver surround means that despite not being either the slimmest nor prettiest LCD around,it never looks anything like the budget option that it is. While the analogue tuner works fairly well,the recent announcements of the end of analogue TV transmissions in the UK over the next five years mean that, as a TV, the N3760w does have a limited shelf life.We expect to see IDTVs with integrated Freeview TV tuners quickly become standard fare on all flatpanel TVs. Still,even though this screen will quickly become just a straight cinema display,that's fine if you intend to pipe Sky in through one of its three RGB Scarts,or Sky HD (or any other form of HD) through either the analogue component video or digital HDMI inputs.Not surprisingly, there's also a PC input in the analogue VGA mould. This is no one-off budget lossmaker put about by ViewSonic; the Californian company also offers 32in (N3260w,£755) and 40in (N4060w,£1,335) versions in this same series,dubbed 'NextVision'. Talking of which, the picture processing under that banner numbers UltraBrite technology to accompany an 8ms screen response time and SRS audio (including a SRS WOW mock surround sound option). If the 'affordable' tag never hangs like a noose, there is at last some evidence of corners being cut when the set is switched on.Firstly, the remote control isn't very good.Slight and poorly designed, switching between inputs - something that's very important in these days of multiple inputs and should be a very simple task - is laborious and annoying. If that's a sign of a convoluted and overly complex operating system,we should state that ViewSonic is a company most used to designing flatpanel LCD monitors for PCs.So the addition of a TV tuner (here it's a simple analogue version) and the switch to a larger, widescreen panel has been done by ViewSonic without properly adapting its software to daily TV use. Despite the simple nature of the picture processing,the performance of this LCD with a variety of footage is actually quite impressive.The high resolution panel is capable of displaying some serious detail. 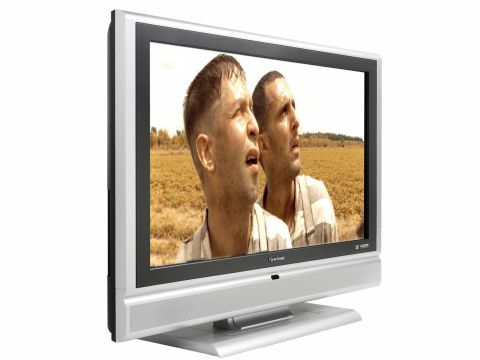 It's good with normal DVDs, especially if paired with a HDMI DVD player that can upscale to hi-def quality (such players are getting increasingly affordable as Blu-ray and HD-DVD 'hi-def' discs get nearer to replacing them).But it's with high definition material where this set wears its HD Ready badge with some distinction. The screen's brightness and colour vibrancy is always impressive despite never reaching the accuracy of much more expensive models, although skin tones are as realistic as can be expected. That extreme brightness - a great strength in many ways - does, however, seriously contribute to the N3760w's main weakness: contrast. Sober footage suffers greatly from a lack of detail and picture noise is a blight.The end result is images that appear to be slightly lacking in depth.This is made all the more surprising by its impressive (but by no means amazing) contrast lab reading. Fast motion doesn't trip up this LCD,something that shouldn't be taken for granted on any LCD TV despite the huge advances of technology over the last few years. With the N3760W,blurring,smearing or image lag are rare. Still,edges of colour aren't resolved perfectly,but again, this is neither unexpected nor a particularly common occurrence. Sound is neither impressive nor offensive, with the set able to handle dialogue accurately but not resolve movie soundtracks with any bass or power. So while we've easily identified why this LCD is priced a lot lower than the top-of-the-range models, the fact remains that ViewSonic has still produced a TV with a performance of marvellous value. Well specified and ably presented, the main problem with this LCD is in actually using it.Switching between inputs,that simplest of operations, is clumsy and there's a definite lack of attention to detail in that respect. Neither do pictures ever approach benchmark in standard, although from HD it's hard to find any serious faults.The pictures do occasionally lack depth,but ViewSonic has come up with an absolute bargain that will suit anyone wanting a reputable screen primed for HD to slot into a home cinema set-up. Just don't expect all the fun of the lower-quality fare.